Panchatantra stories is a collection of short stories originally written in Sanskrit and believed to be written by Vishnu Sharma to instill moral values into children. One day long ago in India, a hunter came to a big tree. This tree was so big that its branches turned back down and went right into the ground again. Then new baby trees would grow up from those very spots. Have you ever seen such a thing? Trees that do that are called “banyan” trees. The hunter threw his net over the tree. The strings in the net sank down into the branches. You could not see the net any more. Then the clever hunter put grains of rice all over the leaves. The grains of rice were easy to see, even from far away. White Wing flew down to the banyan tree. 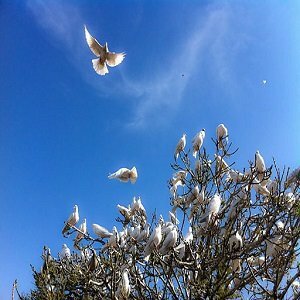 The doves spun around behind him and followed him to the tree, too. But oh no! As soon as they all landed on the tree, each one was trapped in the net! As soon as they landed, each one was trapped in the net. “We know, we know!” cried the doves. “But if we all fly up together at the same time,” said White Wing, “we can lift this net. “Look, the hunter!” cried a dove. “Everyone,” yelled White Wing. “Now!” At once, all of the doves flew up. Together, they lifted the net right up out of the banyan tree. The hunter could not believe his eyes. All the birds he was going to have at dinner were flying up high into the sky – and they were taking his net with them! White Wing and the doves flew with the net over the woods and to the city. There, Wing Wing found his friend the mouse, and the mouse freed them, one and all.